Among the six-figure lots to go through the ring at the Tattersalls Ireland Cheltenham Sale on Thursday was Onefortheroadtom, winner of the four-year-old maiden at Oldcastle the previous Sunday - and the light at the end of a dark tunnel for owner Patrick Turley. After buying Onefortheroadtom as a three-year-old store for €12,500 from John Lalor last August, Turley got straight to work. Over the next few months, he had a lot of the groundwork done in terms of preparation, breaking the horse in and taking him on two cross-country rides. But then disaster struck. Clipping his father's hunt horse, one day last December, Turley took a kick to the head. He fractured his skull, broke an eye socket, and also suffered breaks to his nose and jaw. The accident, which he says was simply a case of being in the wrong place at the wrong time, resulted in a two-week hospital stay. The friendship between Turley and his former employer, the point-to-point handler Brian Hamilton, saw the latter take on the training of Onefortheroadtom. And there was a happy postscript four days after the gelding's three-length success at Oldcastle, in Turley's colours, when he was sold to Kieran McManus for £100,000. 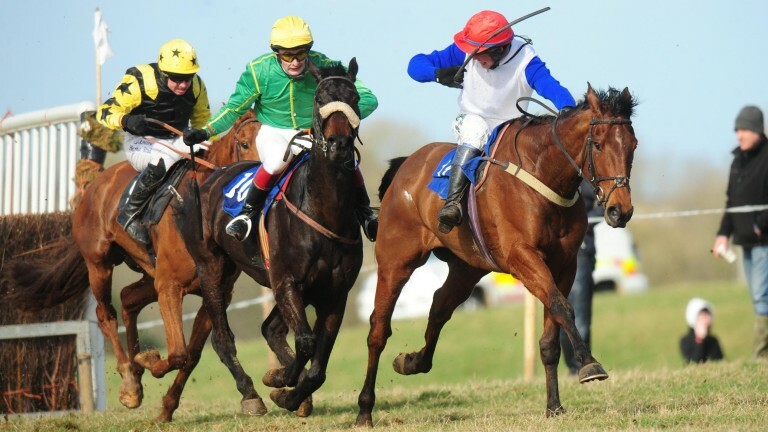 Turley says: "I thought a lot of Onefortheroadtom before the accident, and then he went to Brian, who ran him in a schooling hurdle after racing at Kirkistown one day. "That was his first time away from home proper, and he finished upsides and still on the bridle, so we thought even more of him then. "He had never got a slap behind the saddle or on the shoulder before Oldcastle, and he was very inexperienced and green. He just had the class to go and win the way he did." Describing what initially drew him to Onefortheroadtom as a store, Turley says: "He was a lovely individual. I like a horse with a good walk and a nice presence, and he had both. His conformation was also very good." Turley had recovered sufficiently from his accident to be able to bring Onefortheroadtom over to Cheltenham for the sale, while Hamilton joined him on the Wednesday night. Turley says: "I hope he will be extremely lucky for [his new connections]. He has the speed to go and win a bumper with any bit of luck, and might be a staying chaser type in future." It was not the first taste of sales success for Turley, who sold an Iffraaj colt for €80,000 at the 2015 Goffs February Sale. He was bred from the Oratorio mare Effige, a half-sister to the Goffs Million winner Lucky General. Aside from converting stores into winning pointers, Turley and his father - also named Pat - have eight Flat broodmares between them. And, despite the accident, Turley is determined to keep the commercial show on the road. "My plans for the future are to go out on my own and upgrade my broodmare band, and to continue to pinhook point-to-pointers and breeze-up horses," he says. "I gained invaluable experience during my time with Brian and also later at Tally-Ho Stud." Turley rode 11 winners between the flags, including Pride Of Lecale - bought from Ballyhampshire Stud for €8,000 at the 2014 Goffs Land Rover Sale - in a four-year-old maiden at The Pigeons. Donald McCain bought the Multiplex gelding from Turley for £30,000 at the 2015 Brightwells Cheltenham Sale. Fergal O'Brien trained him to win a Chepstow bumper by 14 lengths for owners Paul and Clare Rooney, and he ran creditably in the champion bumpers at Cheltenham and Aintree the following spring. Turley is also grateful to Roger O'Callaghan of Tally-Ho, who looked after a pair of breeze-up horses he was preparing before his accident. One, a colt by Dragon Pulse, he has sold privately, but the other - a son of Camacho out of the Listed-winning Illuminise - is heading to Goresbridge. The mare has already produced four winners from five runners and, should this youngster sell well, few could begrudge his vendor a continued run of luck.